Representatives of 12 Pacific Island countries are meeting in Sydney this week with maritime experts from Australia and the Pacific Community (SPC) to negotiate maritime boundary agreements and refine their claims to areas of continental shelf. 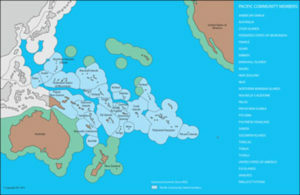 Pacific Island countries have limited land areas but vast space entitlements in the Pacific Ocean, leading Pacific leaders to coin the phrase “Large Ocean Island States”. Delimiting maritime zones is an important process for countries to secure their rights over ocean space and marine resources, including fisheries and seabed minerals. The hands-on workshop will enable the technical and legal teams from each country to work with a group of advisers from SPC, Geoscience Australia, the University of Sydney, the Australian Attorney-General’s Department, the Commonwealth Secretariat, GRID-Arendal and the Forum Fisheries Agency. “This workshop will assist Pacific Island states to establish their full entitlements to maritime zones in accordance with the UN Convention on the Law of the Sea and review their maritime zones legislation,” the Manager of Oceans and Coastal Geoscience for the Pacific Community (SPC), Jens Kruger, said. “The Pacific is really leading the world in this area,” Professor Elaine Baker, Chair of Marine Science at the University of Sydney, noted. “Having established their maritime entitlements, many of the country teams are now developing the tools to manage their marine spaces effectively. This is something that many developed countries are only just beginning to grapple with,” Prof Baker said. This is the 14th maritime boundaries workshop SPC has held for Pacific Island countries since 2002, in conjunction with a range of other experts. These workshops continue to be funded by the Australian Department of Foreign Affairs and Trade. This workshop is the latest example of the technical cooperation between SPC and the Government of Australia and demonstrates Australia’s ongoing commitment to achieving sustainable development results that make a difference to the lives of Pacific Island people.